Mr. Thomassoulo is George’s boss at Play Now, who hired George because he thinks he is handicapped. George signs a one-year contract with Play Now and realizes that he has a great office with a view and his own private handicapped bathroom, so he never admits to not actually being disabled. 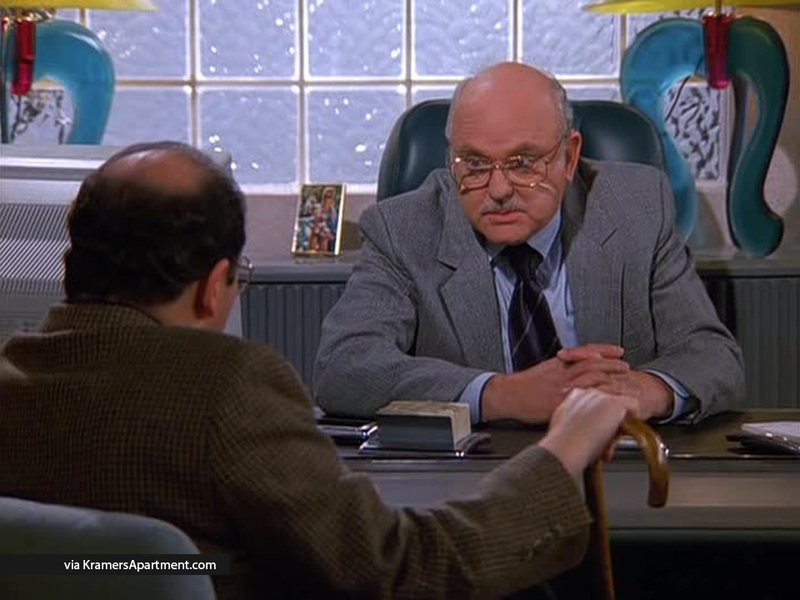 When Mr. Thomassoulo discovers that George is not actually handicap, he asks for his resignation, but George refuses. Instead deciding to do nothing and collect the benefits of his one-year contract. Mr. Thomassoulo is played by Gordon Jump and is featured in two episodes in Season 9. George gets a job interview with a playground equipment company, Play Now, and gets hired because they think he is handicapped due to his use of a cane. 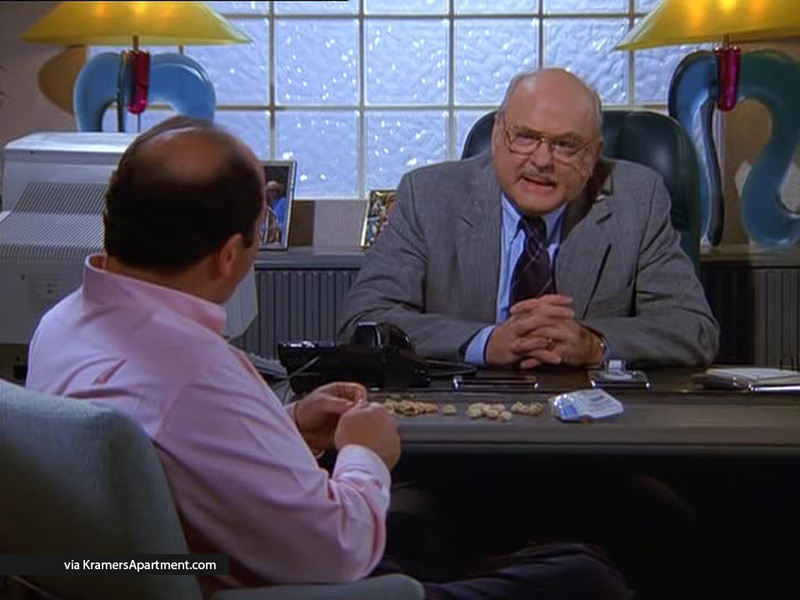 George takes full advantage of the mistake after learning that they offer him an office on the 16th floor and his own fully equipped handicap bathroom. 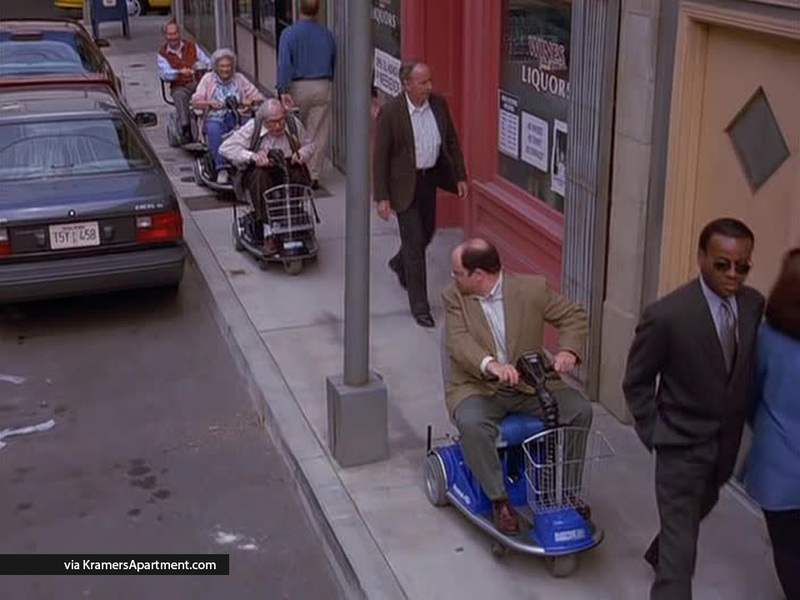 George keeps up his handicap fabrication until he gets chased down the street by an old man in a motorized scooter. 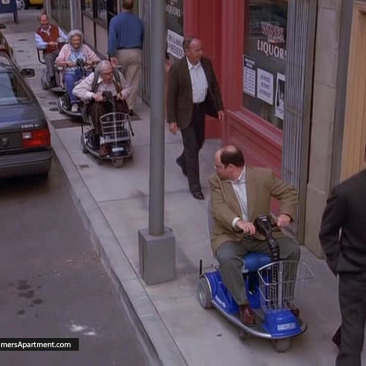 When George picks up his scooter to evade the old man, he is seen by Mr. Thomassoulo, who finally exposes him. Mr. Thomassoulo wants to get rid of George since he found out he isn’t really handicapped. Having signed a one-year contract with Play Now, George decides to meet only the most basic requirement of showing up for work every day to enjoy the benefits of employment. No matter what obstacle Mr. Thomassoulo puts in his way, George is determined to occupy his office. Play Now eventually tries to negotiate with George, but he won’t give in. 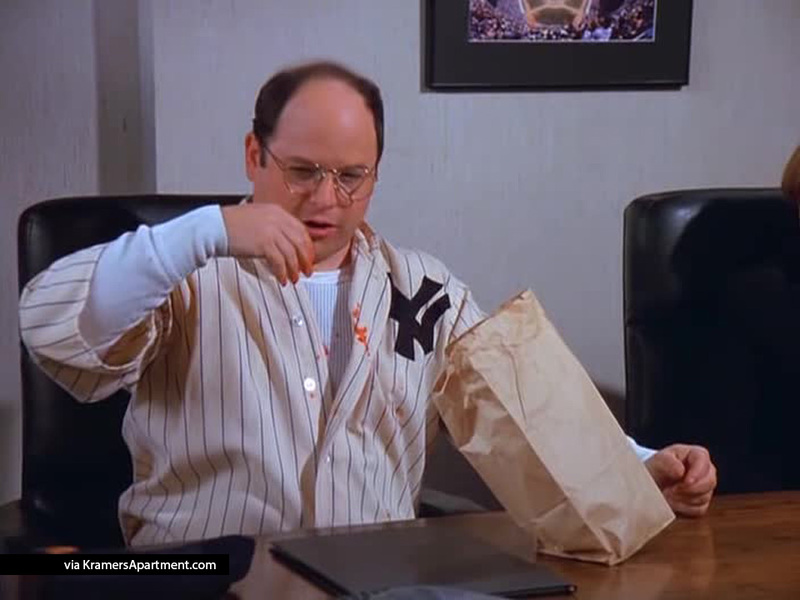 Finally, because of Kramer’s oil tanker bladder test from George’s office window a lawsuit puts Play Now out of business and George out of his contract. Mr. Thomassoulo: I don’t want you to think that anyone’s gonna treat you any differently just because of your, uh, handicap. George: Handicap? (gesturing to his cane) I’m not handicapped. Mr. Thomassoulo: I’m sorry. Differently, uh, advantaged. George: Yeah, I didn’t mean that. Mr. Thomassoulo: Of course you will have your own private, fully equipped bathroom. Mr. Thomassoulo: Good morning, George. Is something wrong with your other leg? 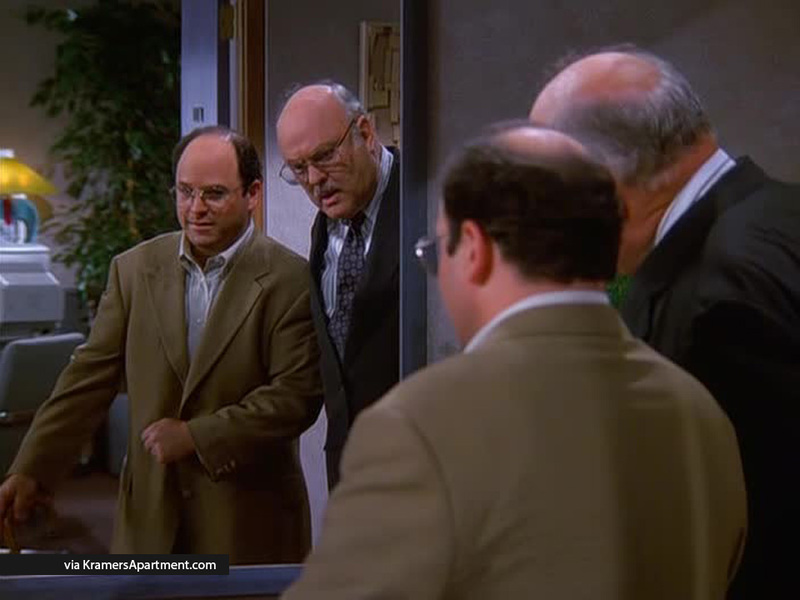 George: Oh, no, that’s just the old handicap acting up. Mr. Thomassoulo: But your cane’s on the wrong side. 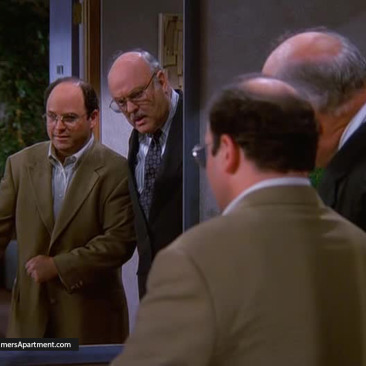 George: That’s just because we’re standing on opposite sides. See, when we met, I was over there and you were over here so the image was reversed, like in the mirror. George: See? This looks right to you, doesn’t it? Mr. Thomassoulo: Uh, yeah, I guess. Mr. Thomassoulo: George? Your legs! George: Are you a religious man, sir? Mr. Thomassoulo: George, you’re not really handicapped, are you? George: I’ve had my difficulties. 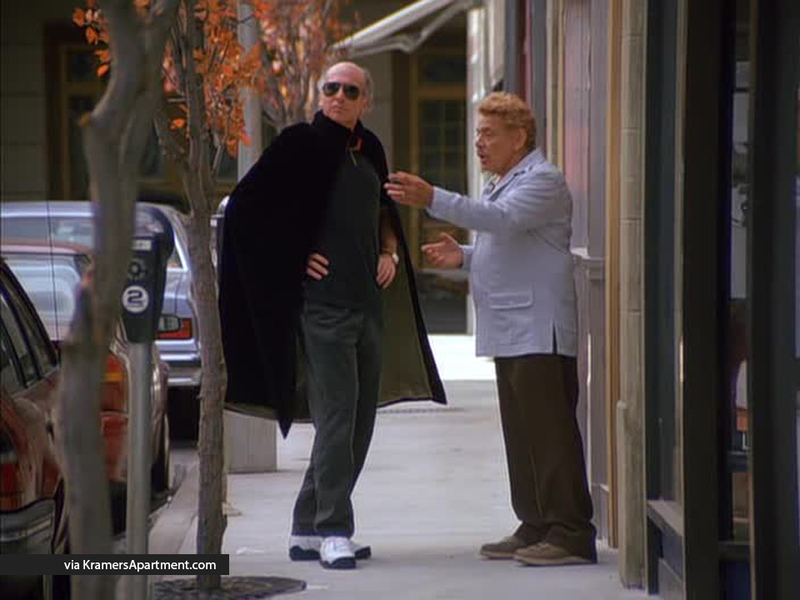 Mr. Thomassoulo: I saw you running down Amsterdam Avenue lifting that 200 pound motorized cart with one hand. George: Mr. Thomassoulo during times of great stress, people are capable of super human strength. Have you ever seen the Incredible Hulk, sir? George: How about the old Spider Man live action show? 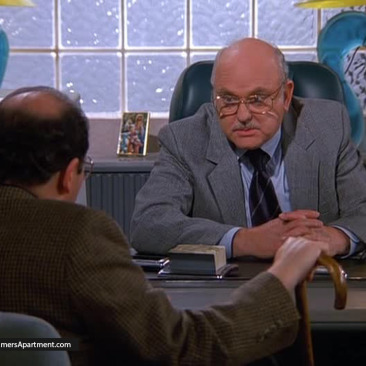 Mr. Thomassoulo: George, I’ve realized we’ve signed a one-year contract with you, but at this point I think it’s best that we both go our separate ways. Mr. Thomassoulo: We don’t like you. We want you to leave. Mr. Thomassoulo: You win George. We’ve had it. If you leave right now, Play Now will give you six months pay. That’s half of your entire contract. Please…just go. George: You see if I stay the whole year, I get it all. Mr. Thomassoulo: Want to play hand ball huh? Fine. 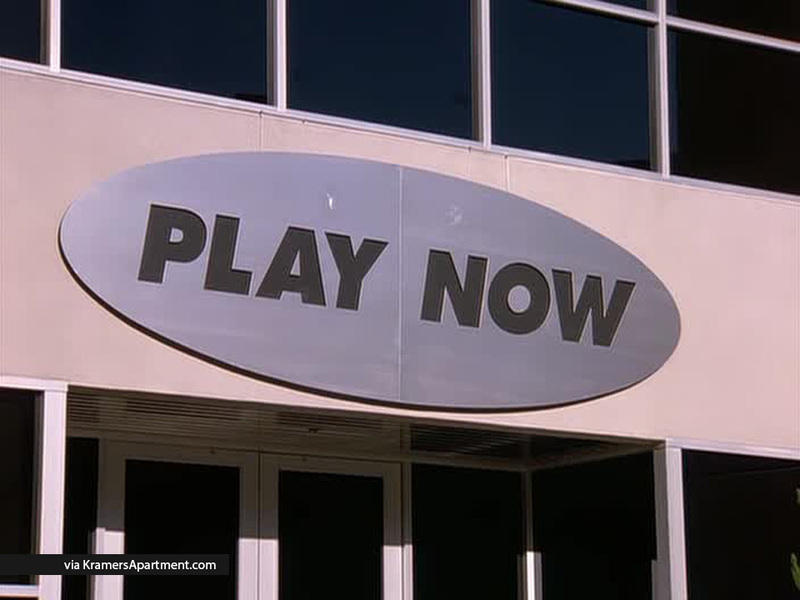 (calls on intercom) Attention Play Now employees, George Costanza’s handicapped bathroom is now open on the sixteenth floor to all employees and their families. 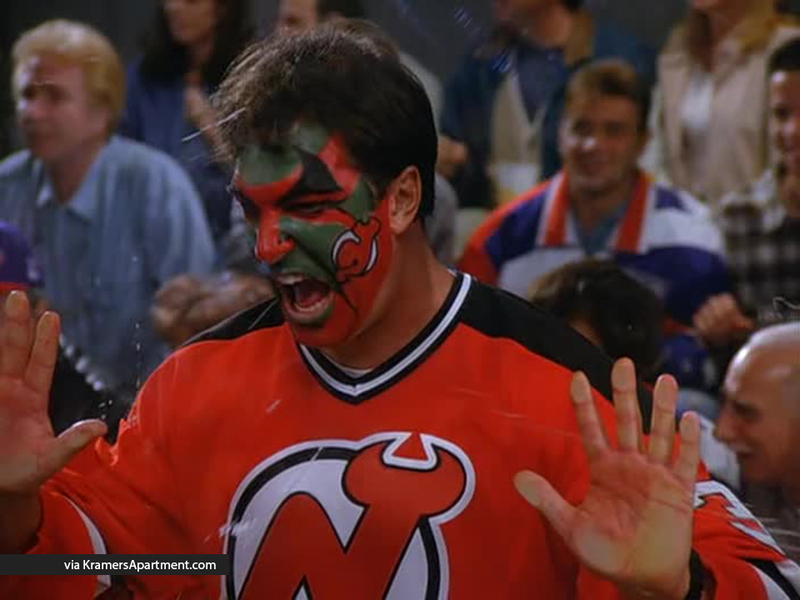 Mr. Thomassoulo: I’ll see you in hell Costanza.